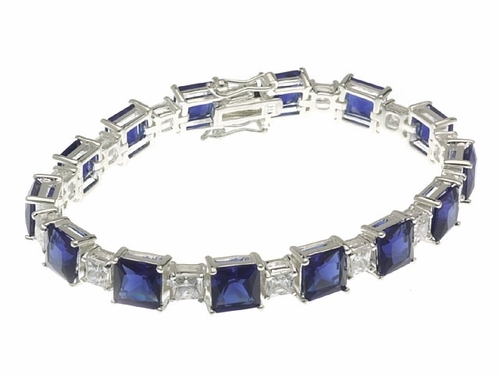 The Winston Sapphire Man Made Gemstone Alternating Princess Cut Cubic Zirconia Bracelet is comprised of all princess cut cubic zirconia shaped stones. They alternate with a basket set 1.5 carat 7mm princess cut square, then a .50 carat 4mm princess cut square. 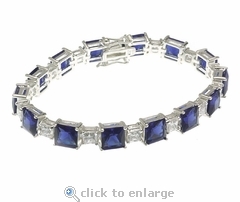 This bracelet is available in different colors of cubic zirconia and man made gemstone alternating combinations that include all diamond look, canary diamond yellow, blue sapphire, emerald green and ruby red with white diamond look. Choose from 14k white gold, 14k yellow gold or luxurious platinum, please see the pull down menu for options. For further assistance, please contact us directly at 1-866-942-6663 or visit us via live chat and speak with a knowledgeable representative.